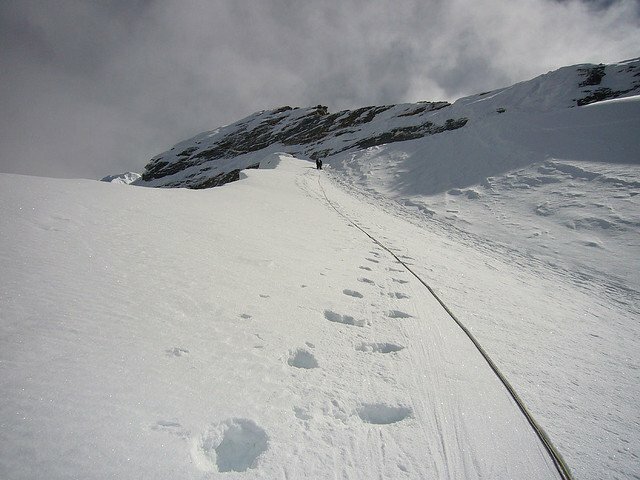 Cholatse is a stunning peak with narrow snow and ice ridges and steep faces. 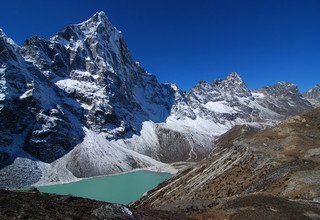 It is on the ridge separating the Gokyo and Khumbu valleys, just north of Taboche and just south of a 5420 meter pass used by Sherpas and trekers alike to go between the Gokyo and Khumbu valleys. Interestingly, there is a lake just below this pass to the east, and in Tibetan 'cho' is lake, 'la' is pass, and 'tse' is peak so Cholatse means literally "lake pass peak". Unlike many mountains, there is no easy way to reach or descend from its summit, so any climb of the mountain is a serious mountaineering undertaking. 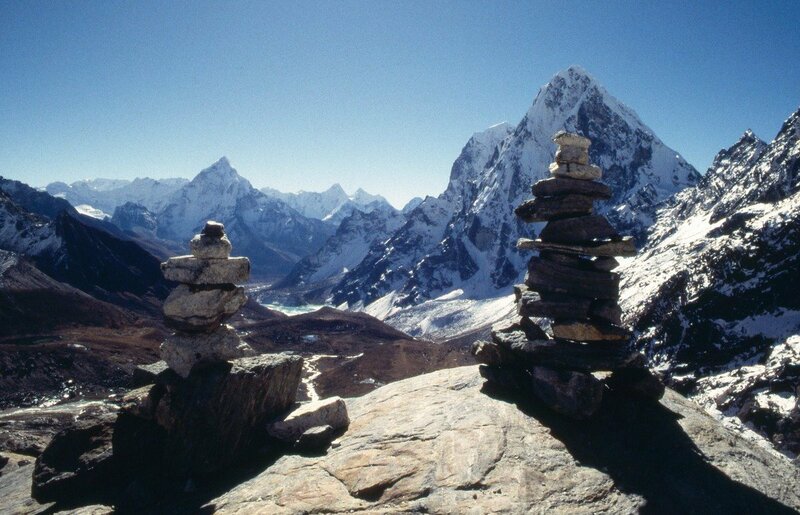 Through the 1950's 60's and 70's, Everest, Ama Dablam and the other named peaks of the Khumbu were climbed on by one but no permits were granted for Cholatse, so it remained unclimbed until 1982 when it was infact the last named but unclimbed peak in the Khumbu. In that year, Al Read from Mountain Travel secured a permit for the peak. In April of that year, Vern Clevenger, John Roskelley, Galen Rowell and Bill O'Connor reached the summit via the South West Ridge. The climb was described as some twenty pitches of difficult ice climbing. Later that same year, a Swiss expedition with Heidi Ludi, Niklause Alpiger and the Nepelese climber Kancha Tamang reached the summit after fixing ropes on much of the South East Ridge. The following year, the startling North East face was climbed by Todd Bibler, Catherine Freer, Penny Jackson and Sandy Stewart. At a slide show, Bibler, who had waltzed up the Eiger's North Face on an earlier European trip implied that the climb was quite scary (VI AI5 5.9 A2). It wasn't until many years later that Tomaz Humar, Ale? 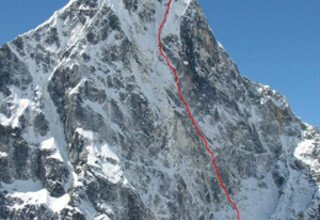 Koelj and Janko Opre?nik made the 2nd ascent of the NE face of Cholatse with a new variation on 23 April 2005. Several additional lines have been climbed including the prominent Western Rib of the West Face and the long corniced North West Ridge. 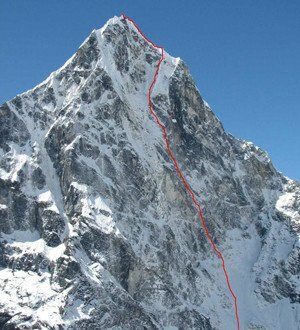 During 2005 a number of variations of the North-East and North Face climbs were achieved including the first Winter Ascent of the North Face by the Koreans Park Jung-hun and Choi Kang-sik who were unfortunately both significantly injured by frostbite following an accident on the descent from the summit. Ueli Steck made a solo ascent of the north face including a direct finish in a 37 hour push from base camp with a single bivouac on the face. 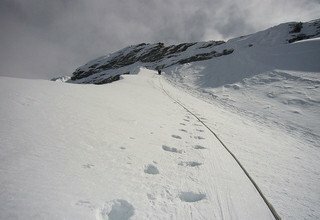 He reports the difficulty as "rock to F5, ice to 90 degrees, and M6 terrain noting the climb was similar in difficulty to the north face of the Eiger. He was named as one of Europe's three best alpinists by "Climb!" magazine as a result of this climb and that of neighboring Tawoche. Day 1: Arrival in Kathmandu and transfer to Hotel. Welcome drink and short briefing about Peak Climbing, relax. Day 2: Arrangement of Trekking Equipment and half day sightseeing tour with our Tour Guide by private car, stay overnight at Hotel. Day 3: Fly from Kathmandu to Lukla 2840m and trek to Phakding 2610m/3-4hours, stay overnight at Lodge. Day 4: Trek from Phakding to Namche Bazar 3440m/5-6hours, stay overnight at Lodge. Day 5: Acclimatization Day, hike to Everest View Hotel and back to Camp, stay overnight at Lodge. Day 6: Trek from Namche Bazar to Dole 4110m/5-6hours, stay overnight at Lodge. Day 7: Trek from Dole to Machhermo 4470m/4-5hours, stay overnight at Lodge. Day 8: Trek from Machhermo to Gokyo 4790m/5-6hours, stay overnight at Lodge. Day 9: Hike to Gokyo Ri 5360m and trek to Thangnak 4700m/2-3hours, stay overnight at Lodge. Day 10: Trek from Thangnak to Dzongla 4830m/7-8hours via Cho-La Pass 5368m, stay overnight at Lodge. Day 11: Trek from Dzongla to Lobuche 4910m/4-5hours, stay overnight at Lodge. Day 12: Trek from Lobuche to Gorakshep 5140m/2-3hours and afternoon side trip to EBC 5364m, stay overnight at Lodge. Day 13: Morning hike to Kalapathar 5550m and trek from Gorakshep to Cholatse Base Camp 4590m/5-6hours, stay overnight at tented camp. Day 14: Preparation Day, stay overnight at tented Camp. Day 15: Preparation Day, stay overnight at tented Camp. Day 16: Preparation Day, stay overnight at tented Camp. Day 17: Climb from Base Camp to Camp I, stay overnight at tented Camp. Day 18: Climb from Camp I to Camp II, stay overnight at tented Camp. Day 19: Climb from Camp II to High Camp, stay overnight at tented Camp. Day 20: Summit to Chalatse Peak 6335m and back to Base Camp 4590m, stay overnight at tented Camp. 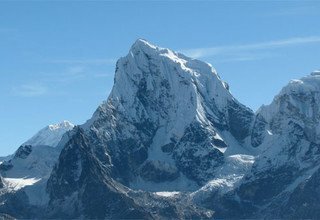 Day 21: Trek from Cholatse Base Camp to Pangboche 3930m/5-6hours, stay overnight at Lodge. Day 22: Trek from Pangboche to Namche Bazar 3440m/6-7hours, stay overnight at Lodge. Day 23: Trek from Namche Bazar to Lukla 2840m/6-7hours, stay overnight at Lodge. Day 24: Fly from Lukla to Kathmandu and transfer to Hotel by private car. Day 25: Full Day Sightseeing Tour in world heritage sites with our Tour Guide by private car, stay overnight at Hotel in Kathmandu. Day 26: Final Departure to International Airport for further destination. * 4 nights accommodation with breakfast at a 3*** Hotel in Kathmandu. 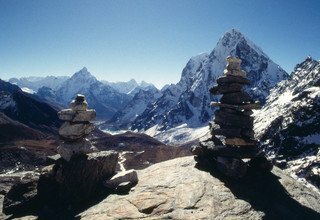 * 1 experienced, helpful and friendly guide, 1 cook and 1 helper, 1 climbing sherpa necessary porters and their salary, equipments and insurance. * Domestic flight ticket Ktm/Lukla/Ktm and all the domestic airport tax. * Camping Equipments Tents, Kitchen Tent, Dinning Tent, Toilet Tent, Mattresses and Kitchen Utensils. * Peak Permit, Climbing Sherpa Equipment Charge and Garbage Deposit. 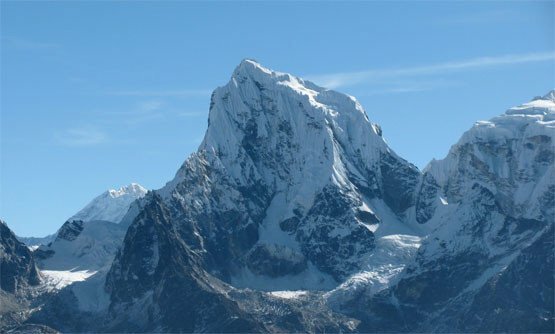 * Sagarmatha National Park permit and necessary permit.